With work drawing towards a close in the surface trenches at the High Pastures site, we have started to excavate the rich archaeological deposits in the cave system below ground. Read on for the latest news of what we have found. During the past two weeks we have started to excavate Trench 6 in Bone Passage. 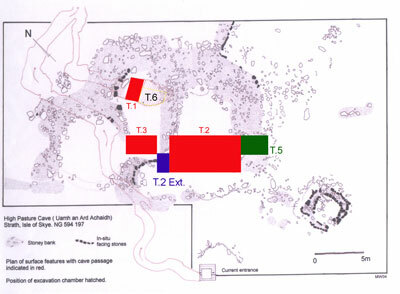 This is an extension to Trench 1, excavated during 2004, that will investigate the paved floor in the cave and the rich and diverse archaeological deposits that are situated immediately inside the original entrance to the cave system. The sediments we are excavating in Trench 6 consist of damp and sticky soils mixed with small and large stone, mainly granite with a few pieces of limestone. This material, along with the artefacts and ecofacts they contain, were deposited in Bone Passage during the Early to Middle Iron Age (at least 2200 years ago) and it appears that a significant part of this ‘fill’ was used to backfill the passage before the entrance was finally sealed. 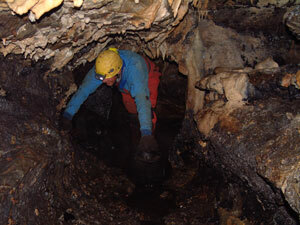 The people who carried out this process certainly wanted to prevent further access to the cave system, for reasons unknown at the present time. 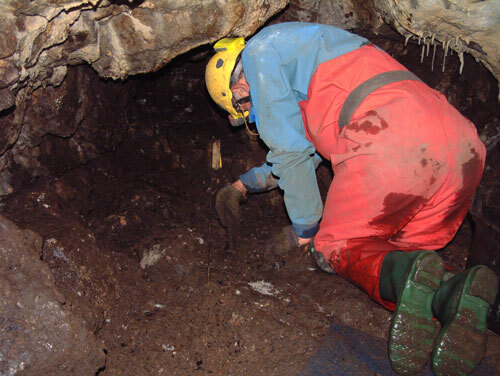 Excavating the deposits in Bone Passage is quite a difficult process for several reasons. First of all, the only light available is of the artificial kind, either from our head-mounted lamps or from battery-operated strip lights carried into the cave. As mentioned earlier the sediments are quite damp and sticky, making trowelling to a clean surface almost impossible. The sediments also contain significant quantities of artefacts and ecofacts, some of which are quite fragile and delicate. To minimise potential damage to this material we excavate using wooden spatulas. Finally, we have to carry the excavated material out of the cave in rubber buckets (kibbles) to the wet sieving area on the surface. This involves traversing around 60 metres of cave system, much of this in an active streamway and some of which comprises low passages. Once on the surface the sediments are taken to the wet sieving area, where a gentle washing action with fresh water separates artefacts and ecofacts from the binding matrix. The resulting deposits are then placed into finds trays where they will be air-dried before placing in marked finds bags and containers. Occasionally, artefacts are revealed during excavation in Bone Passage, especially larger pieces of pottery, antler and animal bone. The last two weeks of work in Bone Passage have produced a wide range of finds including large refitting sherds of pottery. 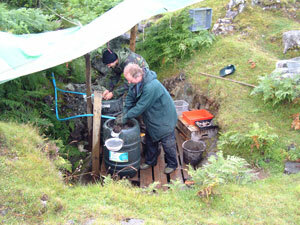 For details of the finds recovered from Trench 6 see the (Latest Finds Page). The excavation of Trench 6 is progressing well and we have removed around 0.25m depth of sediment, leaving approximately 0.15 metres of material to remove before we get down to the level of the paved floor identified in Trench 1 during 2004. The deposit excavated so far looks and feels the same so we have excavated the trench so far in spits of around 0.1 metres, which we then assign a context number. This allows us to keep some form of control of the archaeological deposits we are removing until we reach more recognisable stratigraphy. Although the material appears to be from the same context/depositional event, the wet sieving often provides variables in terms of the artefacts and ecofacts that are revealed. For example, the upper contexts of the trench produced significant quantities of charred cereal grains. The context below this produced only a few charred grains, while lower down the charred grain content once more increased significantly. However, we have also recovered sherds of pottery from different contexts in the trench that refit together, which suggests that the material was deposited in the cave in one episode. This confusing picture should be resolved with more work in the trench and the submission of material for radiocarbon dating. Elsewhere on site, we have now installed display panels in the new site shed providing details of the project and images of the work we have been carrying out at High Pastures over the past couple of years. During the next month we also hope to install the cctv camera equipment and lighting in Bone Passage, along with a monitor in the site shed. This will allow visitors to the site the opportunity to see work in progress in Bone Passage, including the excavation of Trench 6. Don’t forget to visit the site again soon and please post any comments, critical or otherwise, in the area below.